Cuckoos are notorious cheats. Instead of building a nest, incubating their eggs and raising their chicks, they lay their eggs in the nests of other birds and leave the task of raising their offspring to the unsuspecting host. Their eggs are usually the first to hatch in a nest. Then, before it even opens its eyes, the newly hatched cuckoo chick heaves its unrelated siblings out of the nest, leaving it to monopolise the attention of its foster parents. Not surprisingly, hosts defend themselves against parasitism by cuckoos. Hosts can aggressively attack adult cuckoos to stop them from getting into their nest in the first place, and they can learn to recognise and attack cuckoos by watching the response of other birds. It does not stop there. 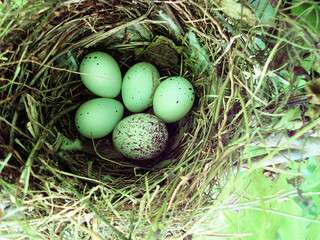 If the cuckoo gets around these initial defences, hosts can reject odd-looking eggs or chicks from their nest. In turn, cuckoo eggs or chicks that resemble those of their hosts are less likely to be rejected. So, through evolutionary time, cuckoo eggs and chicks have evolved to resemble those of their hosts, in some cases to a startling degree. The interactions between cuckoos and their hosts are classic examples of a "co-evolutionary" arms race. When cuckoos face the problem of having multiple host species in their immediate vicinity that have eggs that vary in colour, they deal with the situation in different ways. For example, it has previously been shown that individual female cuckoos can also evolve to lay eggs of different colours to match those of their hosts (egg evolutionary races), or, they can lay dark eggs that, in dark nests, are hard for the hosts to detect and reject. Alternatively, cuckoos could lay an "average" egg, that is not a perfect match of the eggs of any host species, but is a pretty good match of most. It is this latter possibility that was the focus of a study my colleagues and I have recently published in the journal Behavioral Ecology. The question we asked was simple: is there any evidence of evolutionary race in the Horsfield's bronze-cuckoo to mimic host eggs? This cuckoo is an interesting candidate to study this question, as it has more than 30 different species of songbird as hosts, few of which seem to reject cuckoo eggs. 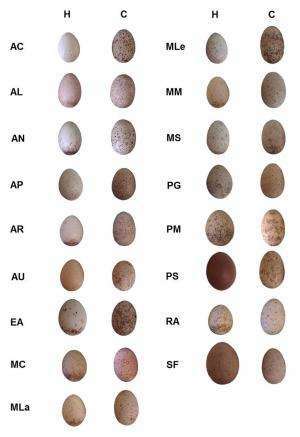 To investigate this question, we took measurements of reflectance spectra – an unbiased measurement of colour – from one cuckoo egg and one host egg from 231 parasitised clutches from the Australian Wildlife Collection in Canberra. It is important to measure colour in an unbiased way – as birds see the world differently to us and this type of measurement can allow us to compensate for these differences. We measured 17 different hosts of the Horsfield's bronze-cuckoo and at least six cuckoo and host eggs for each species (total = 462 eggs). Our analysis found that host eggs varied from one another in colour (when sorted by species) and that cuckoo eggs did not vary when sorted by their host. This suggests that, in the Horsfield's bronze-cuckoo, the evolutionary egg race is not focused on mimicking specific hosts' eggs. Instead, when we looked at how different in colour the cuckoo eggs were from the colour of the different host eggs, we found that in this cuckoo, the difference in was almost the same for all hosts. This suggested that the Horsfield's bronze-cuckoo's may have evolved to use a "jack-of-all-trades" egg morphology. This is the first time this type of egg-laying behaviour has been suggested as the primary egg type of a cuckoo species and adds to a picture of this cuckoo as a generalist in the way that it tries to circumvent the defences of its different hosts.